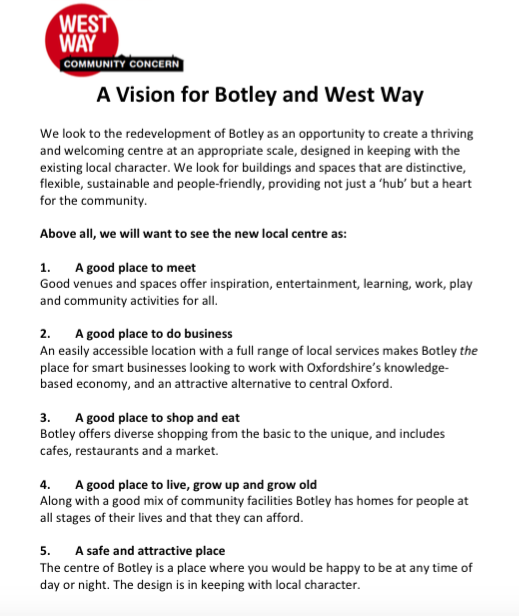 This vision is about what we want to see in Botley in the future. It’s not about what will be built – it’s about HOW we would like it to be and to work. This came from two events on ‘what Botley wants’ back in January with around 250 people. The report on that is here. We then ran a workshop in May that cut that down to five key points and a sentence about each. You can download the vision here or read below. Please share this with your friends. It may seem optimistic, but we should be aiming to get what we want! It’s February 2020, and we’re delighted that Botley has been voted to be ‘Britain’s Best Neighbourhood’ for the second time! Its’ unique mix of good shops and small businesses has made it one of the most desirable places to live near Oxford. So why has it become such an attractive place to live? Much of it started after plans for a high-density old-style commercial development were rejected by the district council in 2014. The Botley Development Trust*, formed soon after by community groups and parish councils, started to work with local landowners and the council to build on the areas’ strengths. The Trust worked closely with developers in 2015 on planning a redevelopment that saw the end of the tired old office blocks and a rebuilding of the shopping centre. In doing so they created a shopping centre that serves the needs of people in Botley, Cumnor and the nearby villages, with a smart supermarket and a range of specialist shops, many in the refurbished Elms Parade building that fronts the local centre. The large number of small traders living in and based around the area emphasised the need for training and business support. Working with local further education colleges the Trust ensured that the redevelopment included college premises that train young and older people for a fast-changing job market as well as serving the needs of the rural communities in south and west Oxford where food production remains important. Alongside this 2017 saw the refurbishment of the ageing and poorly-structured light industrial areas in Old Botley to create a new ‘smart centre’ focusing on IT companies and linking to the needs of the many scientific businesses around Oxford. While Botley is a suburb of Oxford, and benefits from the success of the city, it also acts as a link to the surrounding areas, where local food production has thrived. The small shops in Elms Parade have increasingly catered to food sales, offering a range of specialities not available in supermarkets, many supplied by local farmers. The supermarket in turn benefits from this and has done better than the larger Heyford Hill superstore that nearly closed in 2018 as the number of homes around Oxford getting their main shopping delivered to their doors reached 40%. Many of those deliveries come from the nearby Seacourt retail centre, which is now a city-wide delivery hub. Its’ electric delivery vehicles use the bus lanes into Oxford. Some things have changed, but some problems remain. Botley Road is still congested into Oxford so Botley itself has become a transport hub, linking buses from neighbouring areas and towns with the new ring-road bus service introduced in 2018 that links the various suburbs of Oxford and relieve pressure on the city centre. Fast shuttle buses link Botley to the city centre, while discussions about a new bus road parallel to the Botley road have proved very controversial. Every morning many commuters cycle in and out of the city, many using cycles from the Botley branch of the Oxford-wide hire scheme. The redevelopment of the local centre, completed in 2017, won design awards for its style and for its’ integration of the old and new. The investment in environmental quality has shown what can be done at reasonable cost. The large solar roof across the centre provides a valuable income stream and the energy business that manages it for the Trust has helped many homes across the area cut their fuel costs despite rising national prices. Botley’s popularity has meant that there is pressure for homes. The redeveloped centre included 150 new homes, developed along with local housing associations. This has helped ensure that younger people are not priced out of the area. New housing has filled most the land between the Botley centre and the main Cumnor road, but part of this has become the well-used ‘South Slopes’ park, managed for the council by the Development Trust. In 2017 Sovereign Housing upgraded the homes for older people at Field House, a process done with the full support of the residents. Like any neighbourhood ,Botley faces challenges in the 2020s. But the regularly updated neighbourhood plan offers a framework for secure development, and the resilient community that we have created here offers jobs, homes and above all a place where people want to live. Some of these ideas may seem a long way off, but every one of them is based on things happening now in different parts of the UK. There’s no reason why they could not happen here in Botley. But if it is to happen it needs to start with rejecting the current proposals that will rule out many of these possibilities. * The Botley Development Trust. Development trusts are community organisations created to enable sustainable development in their area. They use self-help, trading for social purpose, and ownership of buildings and land, to bring about long-term social, economic and environmental benefits in their community. In 2014 there are over 450 Development Trusts in the UK. Development trusts create wealth in communities – and keep it there! They are community based and aim to achieve their goals by making profits through trading, providing services and acquiring assets (such as buildings and equipment); and their profits are used to create community wealth that has a lasting impact on the renewal and improvement of an area.